"We have lost our predilection for the monumental, the heavy, the static, and we have enriched our sensibility with a taste for the light, the practical, the ephemeral and the swift." "From an architecture conceived in this way no formal or linear habit can grow, since the fundamental characteristics of Futurist architecture will be its impermanence and transience. Things will endure less than us. Every generation must build its own city." In 1903, at the age of 15, Sant'Elia enrolled at the Istituto Gabriele Castellini to study construction, learning practical elements of building and design but very little in terms of architectural theory. He graduated in 1906 and moved to Milan, where he found his first job as a site manager on the Villoresi Canal. He then began working as a draftsman for the Department of Public Works. Milan in this period was technologically innovative with a thriving manufacturing industry producing cars and, from 1910, airplanes. With a rapidly growing population, the city needed to install affordable housing as well as infrastructure including sewerage, transport links and electric lighting. Sant'Elia's new position made him aware of these discussions and these almost certainly influenced his later urban designs. In 1909 one of his designs, a small, two-story family house, was published in La Casa, a magazine dedicated to residential housing. 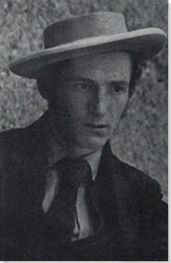 His design received positive comments as well as some criticism from the editors. A few months later he left his job in order to pursue an architectural career, enrolling in a higher architecture course at the Fine Arts Academy of Brera. Here, he attended lectures on perspective, embellishment and geometry. He also socialized with fellow students who would go on to become members of the Futurist movement including Boccioni and Carra. Sant'Elia passed his first year at the Academy but did not complete his second year of studies. In 1911, he traveled to Rome where he encountered Vienna Secession styles for the first time and these had a significant impact on his work. Later in the same year he joined forces with Italo Paternoster, a friend from Brera, to enter a competition to design the new Cemetery of Monza. Their design was called Crisantemo and made it to the final round of the competition. Although praising the artistic design, Sant'Elia's lack of full architectural training must have been apparent in the work as the judges noted that: "The project is marked by felicitous originality however much it may have been inspired by Oriental forms. Nevertheless...the artistic composition...is not buttressed by a matching bravura in the indispensable technical part; on the contrary, the scant and, at times, non-existent correspondence between elevations, sections, and plans constitutes a grave failure which the Committee cannot but deplore". Sant'Elia was invited to work with the architecture firm of Arrigo Cantoni in 1912, acting as draftsman for a design for the façade of Milan's new central railway station. At the same time, he also reconnected with Arrigo Finzi whom he had first met in 1909. With Finzi, he designed a range of kitchenware that went into production briefly in 1914. Although not hugely successful initially, their designs were revived in 1933 to greater acclaim. They included cutlery and a coffee service in the Art Deco style. 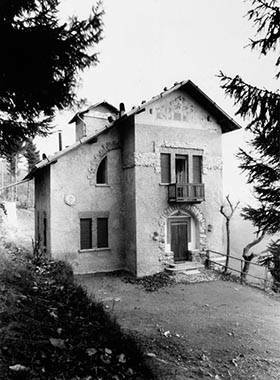 Around this time, he also began work on Villa Elisi in San Maurizio, near Como, a commission for a holiday home for the industrialist Romeo Longatti. This is one of only a handful of Sant'Elia's designs that were actually built and the only one completed during his lifetime. The other key Sant'Elia design to be realized was a funerary monument for Gherardo Caprotti, situated in the cemetery at Monza. Sant'Elia produced a number of different drafts for the project in the period 1913-14, but did not survive to see the structure finished. Drawing inspiration from the new industrial cities of the United States and from pioneering modernist architects such as Otto Wagner and Adolf Loos, Sant'Elia started to complete a series of designs for a futuristic city called La Citta Nuova (The New City) featuring interconnecting skyscrapers, travel networks and skyline walkways. Many of these designs were displayed at an exhibition of the Nuove Tendenze (New Trends) group in May 1914. This brought Sant'Elia's work to wider notice, particularly garnering the attention of the Futurists, an artistic movement, led by the writer Marinetti, which embraced technology and modern living along with violence, youth, and speed. 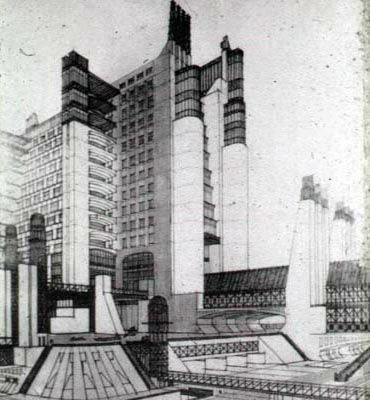 Sant'Elia was encouraged to join the Futurists and his exhibition text from the Nuove Tendenze formed the basis of The Manifesto of Futurist Architecture, that was distributed in August of 1914. This publication was attributed solely to Sant'Elia, but the artist was not generally known for his written polemics and it is probable that he authored it in conjunction with another member of the group such as Boccioni. Some of the manifesto does, however, seem to correspond closely with Sant'Elia's design vision for the future, asserting that: "We must invent and rebuild the Futurist city like an immense and tumultuous shipyard, agile, mobile and dynamic in every detail; and the Futurist house must be like a gigantic machine. The lifts must no longer be hidden away like tapeworms in the niches of stairwells; the stairwells themselves, rendered useless, must be abolished, and the lifts must scale the lengths of the façades like serpents of steel and glass. The house of concrete, glass and steel, stripped of paintings and sculpture, rich only in the innate beauty of its lines and relief". The question of authorship is further confused by Carra suggesting that after the publication of the manifesto, Sant'Elia responded to some of the edits by stating "Don't attribute this nonsense to me. You know that I believe exactly the opposite". From left: Filippo Tommaso Marinetti, Umberto Boccioni, Antonio Sant'Elia and Mario Sironi in the Volunteer Cyclists during WWI. 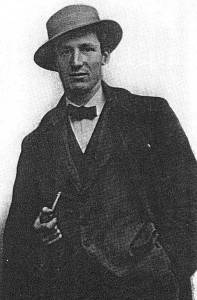 Along with other members of the Futurists, Sant'Elia joined the Volunteer Cyclists Battalion of the Italian army when Italy entered World War I in 1915. Here, he took part in the conquest of Dosso Casina. 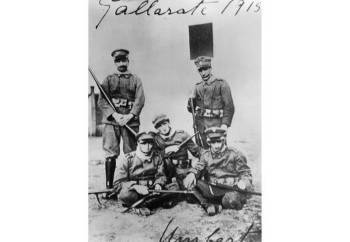 In November 1915 the Battalion was dissolved and Sant'Elia was reassigned to the 225th Regiment of the Arezzo Brigade as a Second Lieutenant. In July 1916 he was wounded, receiving a silver medal of military valor for his bravery. After a brief period of recuperation, he re-joined his regiment and was also tasked with designing the war cemetery for the Brigade. On 10th October 1916 he was killed during the Eighth Battle of the Isonzo, near Gorizia, he was 28 years old. His body was buried in the cemetery which he had designed earlier in the year. Best known for his Citta Nuova designs, much of Sant'Elia's work was extremely innovative, looking ahead to styles and machinery that would finally be realized many years later. The architect, not only, pre-empted the wider incorporation of new technologies into buildings, but also the Art Deco aesthetic of the 1920s and 30s. Whilst most of Sant'Elia's designs never came to fruition, his work influenced many subsequent architects and urban planners. Famous amongst these is Le Corbusier, whose designs for Ville Radieuse (Radiant City) from 1930 - also unbuilt - owe a significant debt to Sant'Elia in terms of central design and organization. 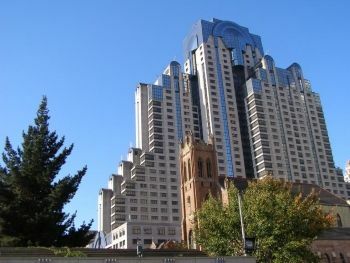 Elements of Sant'Elia's drawings can also be found in the Art Nouveau buildings of Giuseppe Sommaruga and in later work, such as the 1980s designs of John Portman (Marriott Marquis Hotel, Georgia) and Helmut Jahn (James R Thompson Center, Chicago). The beauty and futuristic nature of Sant Elia's monolithic skyscrapers and aerial walkways influenced other forms of art, particularly the creation of cinematic universes in films such as Fritz Lang's Metropolis (1927) and Ridley Scott's 1982 classic Blade Runner. Sant'Elia also inspired a second generation of Futurists in interwar Italy where his use of perspective and bold Modernist lines can be seen in their aeropitturas (aeropainting). 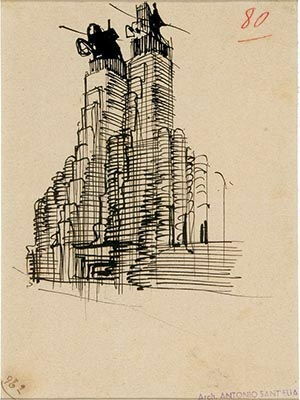 Additionally, Marinetti continued to display and disseminate Sant'Elia's work in a carefully controlled manner to further the Futurist cause. Many of Sant'Elia's early designs were made for competitions or submitted to magazines. In doing this, he garnered publicity for his work as well as getting constructive feedback on it. 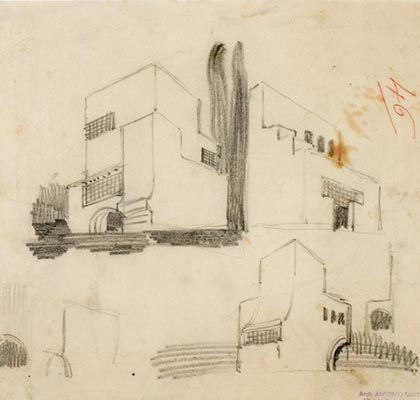 Studi per una villa priva di decorazioni (study for a villa without decoration) is a later version of a design for a detached house that he first submitted to La Casa magazine in 1908. Here, he shows his developing drawing skills, presenting the villa from different angles. The beginning of his distinctive Modernist architectural style is also present; geometric grids of windows, archways, curves and stair-like structures all became reoccurring features in his later works including Villa Elisi. Unlike some of Sant'Elia's other work, this design shows no hint of historicism and as the title suggests the villa is unadorned. Although innovative and hugely different from the Italian vernacular of the period, it is probable that Sant'Elia drew some inspiration for the design from other architects, particularly the shapes of Adolf Loos.